Sightseeing in Delhi’s most scenic bus route. 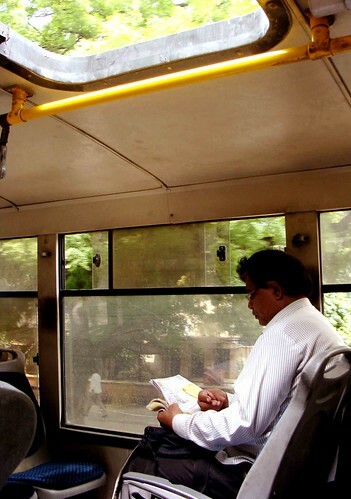 Dear reader, we shall soon spot those DTC buses only in books and films, for they would be no more than a dream (or a nightmare?) remembered, a civilisation gone with the wind… the day is not far when our commute would happen under the ground and we would forget how this city looks like in different seasons. July 14, 2000 Shivaji Stadium, Connaught Place. Rainy afternoon. No umbrella. Strong wind. Under a bus shelter. Waiting. Waiting. More waiting. Finally, 620 rumbles in. I take my place on the right. No seat here reserved for women. Four more people clamber aboard, including a young mother with two children. The journey starts. Motoring down the Outer Circle. Its landmarks rolling past in a diesel-propelled blur: Madras Café, Mahatta Photo Studio, Nirula’s, Shankar Market, Statesman Tower, Jeevan Bharti building. The bus is turning to Parliament Street and stops at Jantar Mantar traffic light. The red stone of the 16th century observatory looks impotent. Its sundial has no use; there’s no sun. The red light turns green. The bus moves. Grrr! Sudden lightning. The wind gets fiercer. Trees swaying like sleepy djinns. Sansad Bhawan appears and disappears – in a flash. Water trickles into the bus. I close the window. Rashtrapati Bhawan coming into view. A sudden spray wets the glass. Behind the wet windows, the edifice is looking dreamy, unreal. Now, a dilemma. To continue admiring it or look left, towards India Gate. Or just marvel at the great expanse of Rajpath. Its prospect is beautiful but too grand, too forbidding for me. However, the road ahead is more hospitable. The three guards at the Teen Murti roundabout seem friendly but we leave them behind. A car overtakes our bus. Its shrill horn, echoing in the air, soon fades. In Shantipath, the earth is green with grass. The flowers on the hedges are nodding like ghosts. The blue dome of the Pakistan embassy soars above the trees. The bus stops. A squirrel scurries away like a midsummer’s night dream. A lady, and she alone, enters, drenched in a purple sleeveless blouse. I gaze at the mole above her lips. She grimaces. The driver switches on the ‘deck’ – Aaj mausam bada beimaan hai. We drive on. Past National Railway museum, through Motibagh crossing, past Sangam cinema. Hey look, there’s Malai Mandir over that hilltop. Someday I will go there. The bus stops again. My stop here. July 14, 2070 Headline In order to introduce the history and civilisation of Delhi’s dead bus culture to domestic and foreign tourists, the Municipal Corporation of Delhi (MCD) has decided to establish a DTC Heritage Museum and a Tourist Information Centre at Shivaji Stadium. hey i chanced upon your blog. it is very nice and the city of delhi needs all the pr it can get. i shifted to this city in 2002 and ever since made it my new home.i love r.v. smith, though i havent read his book. at one point he used to write in the hindu, delhi edition on mondays. I spent several years traveling this same route between Shivaji Stadium and the IIT Hostel Gate bus-stand. Thoughts, not unlike the ones in this post, would go through my head every time. Been a while since I left Delhi, but the love story continues. Thanks, Mayank, for helping keep those memories alive. Once, en route to somewhere, we were driving down Shanti Path, and my friend said it was a lovely road to take a bus along. He then reminisced for ages how he used to enjoy his 620 ride back in college. And now this article here. I am guessing the common people in Delhi do not take that route very often, or how would one be able even to see what’s outside the bus??? Hi Mayank,Was doing a search on Delhi walking tours and came across your absolutely addictive blog. Loved this post.